For a number of years North Main Street had experienced a gradual economic decline and pedestrian and bicycle traffic was almost nonexistent, as conditions did not promote such. As a disorganized two-lane road, North Main Street had little character with minimal sidewalks, undefined parking, and a chaotic cluttering of overhead power lines and signage. Patrons to downtown businesses would park and go directly to a retailer or office and then quickly leave the area once their single-purpose trip was concluded. Reasonable traffic counts should have promoted a stronger economic environment, but there was no appeal for drivers to stop, linger, and explore. Rallying behind an illustrative vision, Town of Kernersville staff and elected officials, downtown property owners and businesses, the North Carolina Department of Transportation (NCDOT), Duke Energy, and Forsyth County Utilities partnered to transform North Main Street into a vibrant pedestrian and bicycle friendly environment that fosters economic development and civic pride. North Main Street in downtown Kernersville was a two-lane road with unstriped on-street parking on both sides, limited sidewalks, and generally very few organizing elements. Downtown had gradually declined, becoming unattractive, perceived unsafe, and thought to have a shortage of parking. Additionally, citizens did not like the cluttered appearance of overhead utility lines, but knowing the high cost of relocating those utilities underground, they were pessimistic that a solution existed that the Town could afford. For many years the community had discussed improving North Main Street, but no consensus could be reached and many feared construction would only make matters worse. While the street infrastructure and overhead utility lines were a concern, business owners were more alarmed by flooding issues in the downtown. 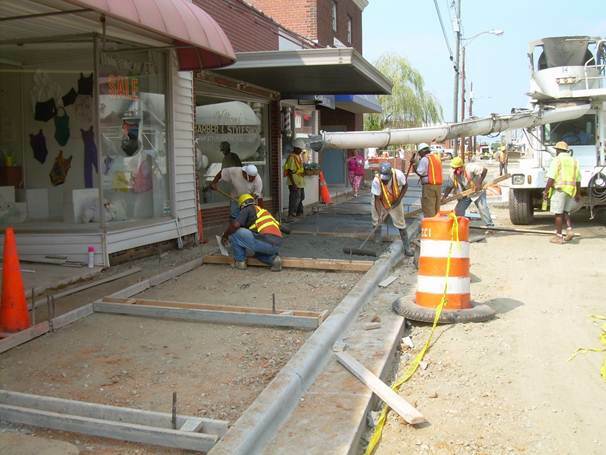 After receiving a number of complaints, NCDOT realized that the crown of North Main Street was actually higher than the thresholds of the front doors of businesses. This caused water during heavy storms to drain directly to these doorways, resulting in flooding of properties. In 1995, following many years of debate, citizens, public officials, and Town staff were able to rally around an illustrative drawing completed by Sharon Richmond, a newly hired member of the Town’s planning staff. Sharon’s background in landscape architecture enabled her to capture the desires of the community and focus the vision for what downtown could become with the proper streetscape infrastructure in place. The illustration was marketed to public works, the Board of Alderman, NCDOT, Duke Energy, and downtown property owners and businesses, providing a position of consensus for the community, depicting the downtown as a vibrant and attractive destination. While the Town now had a unified vision in place it would still take many years to achieve. However, the Town of Kernersville did not waver from its position that downtown could be renewed. 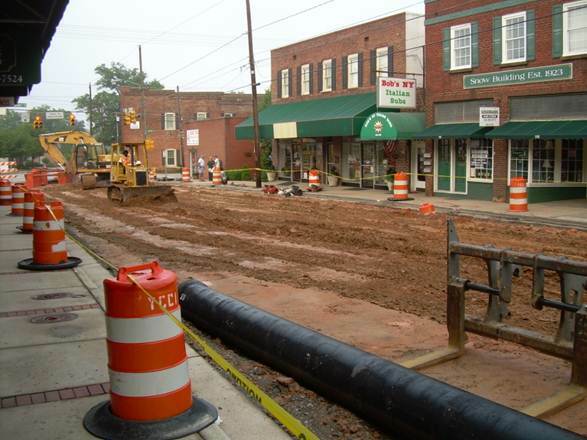 Finally, in the mid-2000s, the Town collaborated with NCDOT, Forsyth County Utilities, Duke Energy, residents, and businesses to craft an improvement project that addressed multiple concerns at once. North Main Street between Mountain Street and Bodenhamer Street was transformed. Asphalt, curbs, gutters, and sidewalks were completely reconstructed to address drainage issues and alleviate flooding. With water and sewer lines reaching the end of their useful lifecycle (i.e., many 60-plus years’ old), it was deemed appropriate and timely to replace these facilities while the street was under reconstruction. Due to the presence of a transmission main, overhead utilities could not be relocated underground; however, a compromise was reached and utilities were relocated to the rear of properties, removing visual clutter that had hampered the aesthetics of the central business district. 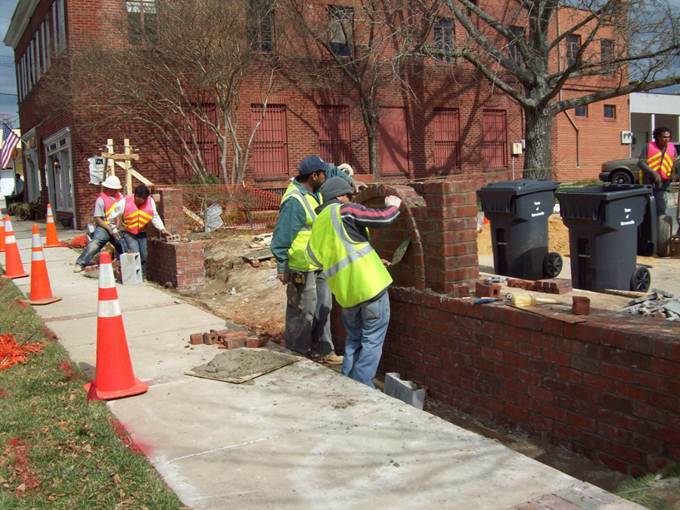 Over $3 million was spent on the improvements and construction occurred over a two-year period in 2006 and 2007. Even with widespread support for the project, some downtown business owners and residents were concerned that parking would be ill-affected by the improvements and the economy of downtown would suffer as a result. Town staff took their concerns seriously and performed a parking analysis that demonstrated that the well-defined proposed on-street parking along with two paved off-street parking lots would meet the needs of downtown businesses. In the end, the parking shortage was deemed a perception problem, rather than a reality. As additional insurance, the Town invested in a well-designed downtown wayfinding system that clearly directs downtown visitors to the location and availability of parking. 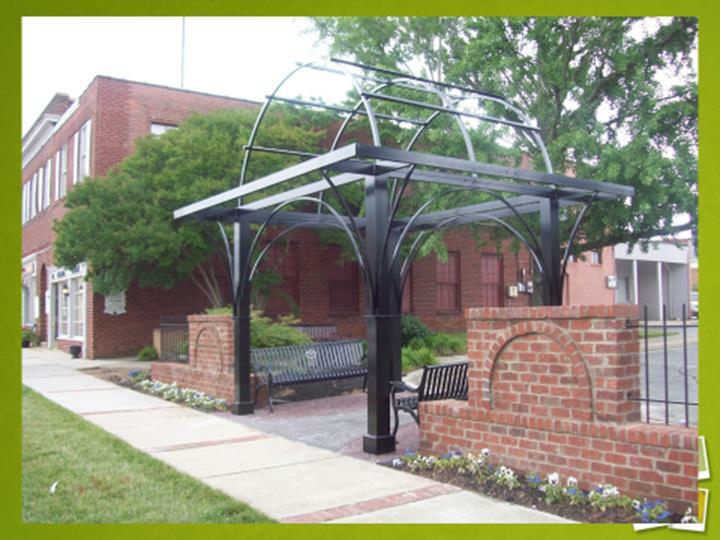 The streetscape improvements along North Main Street have resulted in a number of positives for downtown Kernersville. Wider sidewalks, street trees, street furniture, and lighting have increased pedestrian traffic both in the day and at night. While no specific bicycle facilities were implemented, the more structured street environment has resulted in additional bicyclists in the downtown. The presence of more people on foot and on bike has brought a renewed interest for existing and new businesses to locate along North Main Street. Compared with 1995 when the vision was first articulated, the number of businesses along this principle corridor has doubled, including retailers, salons, home furniture shops, restaurants, and a bakery. While everyone expected the project to improve the attractiveness of downtown, and it was hoped that it would result in economic development, one result was a bit unexpected. That unanticipated consequence was a community in agreement about its vision and overflowing with civic pride. As the vision was communicated and construction began, citizens and businesses rallied around the project. Reanza Murray, a Kernersville Downtown Preservation and Development Council board member summed up the community’s desire to have a downtown they could be proud of in simply stating, “We wanted to make it a quaint downtown.” Street furniture was donated, with many of the benches being given in honor of someone. During construction, a section of original 1800s street cobblestones was discovered and incorporated into the design to serve as a point of pride in the history of Kernersville. A botanical garden, event center, and restored train depot have all been attributed to the investment that was made along North Main Street. 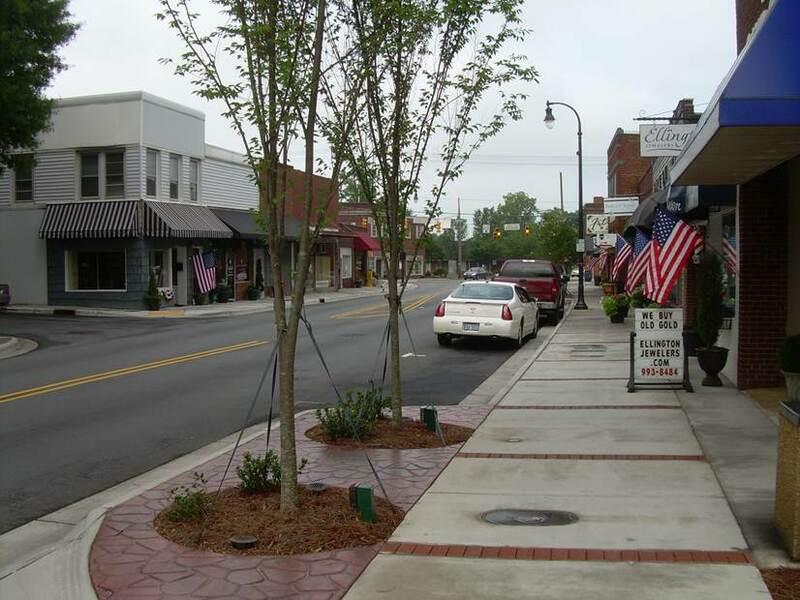 Additionally, in 2009, the Town received the Benjamin Forsyth Award for “exemplary work in revitalization” from the Forsyth County Appearance Commission. Richmond, S. (2014, September 15). Discussion of North Main Street Streetscape Project.